This adventure actually started at 10:30 the night before. 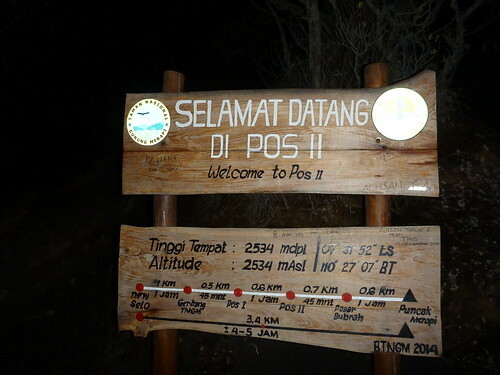 Since most people take about four hours to reach the summit and since the sun rises at 5:30 when you are this close to the equator and since the mountain was a two-hour drive away I met my driver at 10:30 PM the night before. The drive was half of the adventure! As we left town and headed into the country the roads got even more narrow than usual. Then the road tipped up. Finally we encountered a massive repaving project. Turns out the original road was never meant to handle heavy trucks. It also turns out that the volcanic rock and sand from this volcano is in high demand for construction. I was told the sand makes superior concrete and the rock is nice and light so easy to carry and in Indonesia where much of the labor is manual, this is a premium. The demand means there is a string of trucks that pour down from the mountain every night and each truck is fully loaded with rock and sand. Even volcanic rock and sand weighs a lot when you are talking a full truckload and these heavy vehicles had buckled the asphalt road. The road was in shambles. There were sections where the pavement was totally missing and we were driving on dirt. Other sections were full of massive potholes. At the same time that we are trying to navigate this deteriorating road, the government is trying to replace the asphalt with concrete. The upshot of this is much of this twisty, turny road which was already very narrow and had frequent grades of 15-20% was now mostly just one "lane" wide. And trucks full of rock and sand were still streaming down the mountain. Exciting stuff. Around 12:45 AM we pulled into the driveway of my guide's house. These guides are just farmers that make a little cash on the side leading tourists up this trail. Not surprisingly - most tourists that want to hike up this volcano are not well prepared to do so. 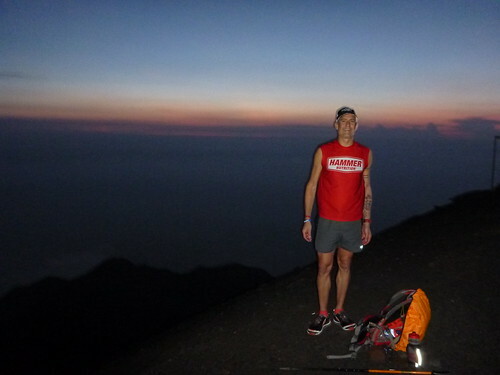 Here I was with my trail running shoes, shorts(! ), high-tech layers, a bottle full of fancy pants sports drink (Hammer HEED of course), some Hammer Gel and they simply could not believe me when I said I would be okay. In the end they insisted that I carry two more bottles of water, a package of cookies and a trekking pole (they could only find one). They even wanted to give me long pants but I managed to decline that offer. ASIDE - full disclosure, the hotel my friends and I were staying at (Alamanda Villa) where I booked the guide gave me a puffy jacket, fleece gloves and a backpack so it wasn't like I brought all my own gear from home but it must have been pretty funny listening to me trying to convince these locals that I had a clue about what I was getting myself into. We had a cup of tea and chatted and at 1:15 AM my driver drove my guide and I up the last km of pavement to the start of the trail. I asked my guide why this was the case and he told me it was so "motorcycles could go up the trail". My Indonesian was nonexistent and his English was not fluent but I suspected this wasn't what it sounded like... More on that later. At 1:30 AM we headed out. This trail was STEEP! So steep that my heels could not touch the ground. And the grade didn't ease any when the concrete turned to dirt. I was having flashbacks to the Power Line climb at the Orcas Island 50k. This trail caters to tourists. Every km or even half km in some cases there is a "resting station" which consists of a raised platform under a roof. It rains a ton in Indonesia and this ensures you can find shelter from 1) the water running down the mountain and 2) the water falling from the sky. There are signs/progress markers all the way up the trail, until you get to the scree slopes near the top anyway. These signs tell you just how far you have gone and how far there is still to go. 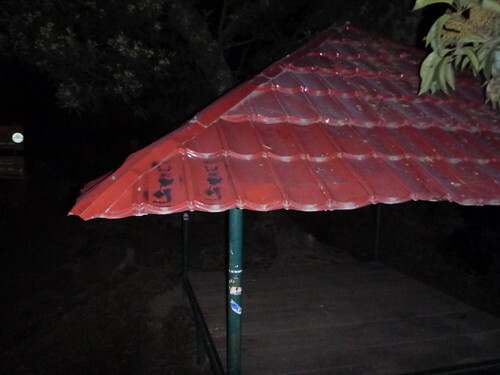 Each red dot on the sign is one of these covered resting stations. As you climb you work your way through lots of micro climates. 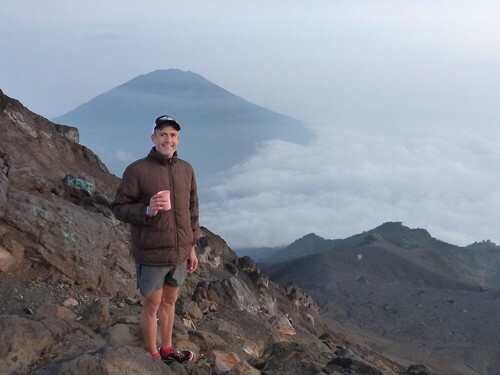 At the bottom it's the usual hot and humid you would expect from Indonesia and as you move up the air gets dryer and dryer and you are more exposed to the wind as you climb above tree line. On the way down when I could finally see I noticed that the top was just scree, then you hit small bushes and then you enter a forest of 30' pine trees. Toward the bottom the trees turned to palms and local farmers had cut terraced fields into the hillside and were actively tending their crops. It was like a mini Haleakala on Maui. Every so often my guide would ask me what time it was and when I would reply he would appear concerned. More on that later. I suspect my guide did not identify as a "trail runner" by any stretch of the imagination but I started up this trail at a pretty good clip and he had zero issues keeping up. His hands also never strayed from the shoulder straps of his backpack meaning as he climbed up the technical trail that was sometimes literally just a root ladder, he was always perfectly balanced. It was awesome to watch. At a couple of these resting stations my guide would insist that we stop. At first I was a little impatient but then it slowly dawned on me that we were taking literally half the time it normally takes tourists to get up this trail and if we hit the summit too early it might be a bitterly cold wait for the sun to rise. So in short order I mellowed out. Let's just say that we had lots of time to talk and I got to learn some cool facts about life and my guide. He really is a farmer. 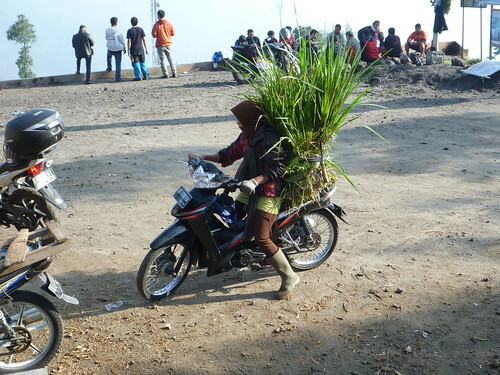 Farming in hilly Indonesia is a crapload of work. He used to carry 70-90 kg bags of grain on his head. His brother (who is "much stronger") could carry 110 kg bags of grain on his head. 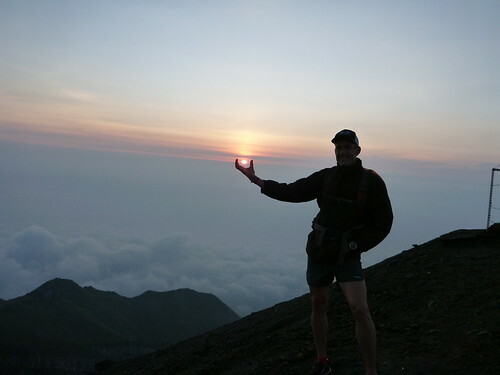 Now he's "taking it easy" leading tourists up this volcano part time. Griping about how your "training" trail shoes are 2 oz. heaver than your "racing" trail shoes is a 1st world problem. 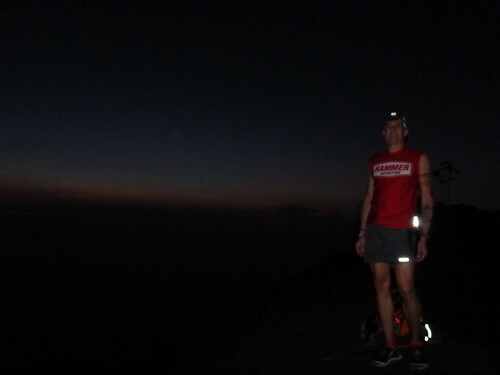 The last climb up the scree slope to the rim of the crater was not easy. For every two steps forward you would slide one step backward until the very last few hundred meters where the scree changed to solid rock. My guide told me most people take about one hour to scale this last .5 km. We did it in about 25 minutes. It was beautiful up here! And still very dark! As the sun started to give us some light I explored the rim of the crater. This was an active volcano that erupts about every five years. When was the last time? In 2010 of course. :( There is sulfur smoke billowing out of mountain and it was pretty cool to see. And smell! It got a little windy at the summit but luckily not as cold as my guide had made it sound. Still, I appreciated my warm jacket. And then the sun started to rise above the clouds... There is no substitute for being on top of the world at this time of day. And as it turns out, my guide had some experience posing people in these moments. Awesome! This crater looked like Mount St Helens in that one side had been blown out, that's where the lava usually flows. We had climbed up the other side. I suppose this was (a tiny bit?) safer. 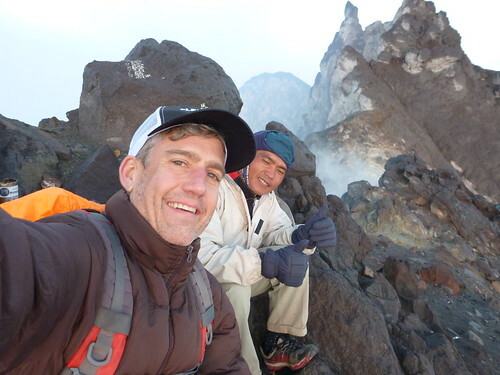 Up here - and dotting the peaks all around us - are seismic stations that make up an early warning system in Indonesia. And I guess the system works! In 2010 people had 20-30 minute warning before the eruption. I had to walk out to the one up here on the crater. Before we packed up I offered my guide a Nicciola Hammer Gel and he loved it! I have learned that Nutella is an international language. I got some last shots before it was time to head back. If you look closely you can tell that my guide is wearing two jackets (over two long sleeve shirts), a buff, a warm hat, long pants and ski gloves. I guess "cold" is always relative and when you live in a warmer climate you tend to need more insulation. Finally it was time head down. On the way down we didn't really hold back. :) Once we got off this rocky crater and hit the scree slopes my guide sped up. And of course so did I. Soon we were running/skiing down the scree a la Kilian Jornet and I suddenly noticed that we were going about as fast as I was able. It was 1) a freaking blast and 2) impressive to see this non trail runner go quicker than 95% of the people I know who identify as trail runners. It was a powerful testimony to what living in these conditions will do for you. This time there was no stopping at the covered shelters and we ran not just the scree but also the dirt trail. Again the balance of my guide was flawless! So fun to watch. We finally got down to the paved section of trail near the bottom and I tried to get some footage to illustrate how step it is, I was only marginally successful. But I did find out what my guide meant by the pavement helping "motorcycles". Turns out farmers drive their scooters up here to work the fields and then either walk or scooter their crops back home. I'm surprised that scooters could even make it up this grade but they sure did. It gave me the chance to soak in some things and contemplate some others. The trailhead was littered with trash! There were some college kids meeting up here after a hike and when they had finished lunch they simply tossed their trash next to a building. This is 100% the standard thing to do in Indonesia. I honestly don't think there is any trash collection service in this country. To illustrate this, I never saw a single garbage can. Garbage attracts flies. I was swatting them incessantly unless I kept moving. Let's just say I had an extended cool down. I could not believe the size of some of the loads farmers were driving and walking out of their fields...! One older woman, barefoot, carried a bundle of firewood on her back that would have broken me in half. Good times! I'm so fortunate for the opportunities to explore places like this and that my body is able to do so. It never gets old.